The Bruno Farnocchia Memorial Park is 3.18 acres. It includes a playground, horseshoe pits, picnic tables, barbecues, portable restroom, and a tennis court. It is also the location of the the dog park and community garden. This is a our largest park located among towering trees and a seasonal creek; a perfect place for a family gathering! The Dog Park and Community Garden are located at 4800 Rio Nido Road within the Bruno Farnocchia Memorial Park. The dog park allows locals and visitors a place to play with their dogs. 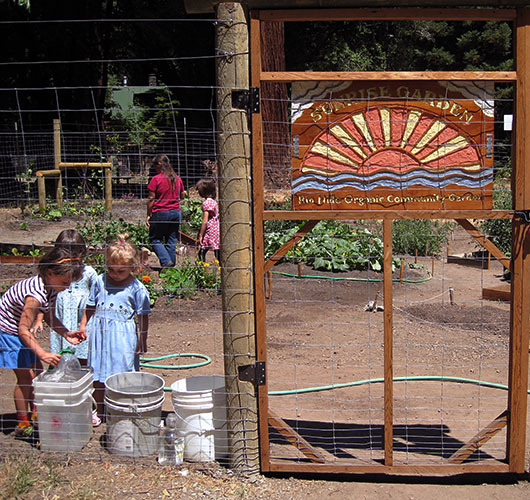 The garden is managed by a group of community members and plots can be obtained through a waiting list, please contact the district for more information.